All photos courtesy of David Bradford--thanks! 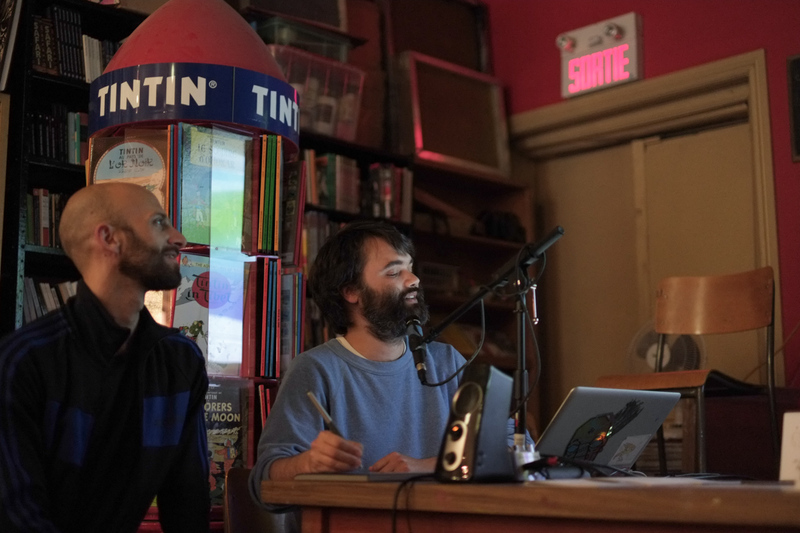 Last week we were happy to host Seattle-based animator and cartoonist Stefan Gruber on his current epic tour--especially since Montreal was the furthest he'll be traveling from home. The audience got to order from a menu to pick which animations and performance pieces we'd be watching, which was super fun! 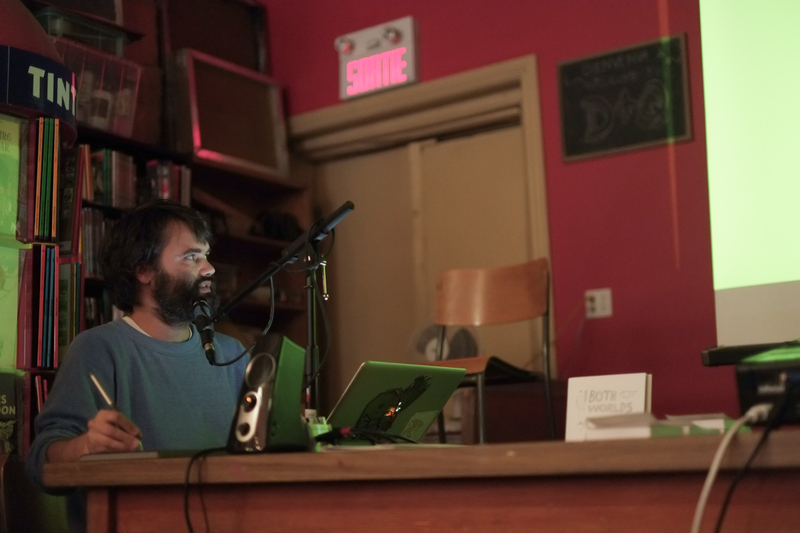 We started out with a couple of "Psychic Portraits," in which Stefan, as the self-professed son of a "psychic-slash-ghost-buster," would improvise an animation to illustrate the personal vibes of our two lovely audience volunteers. Then we got to watch the result. We watched a bunch of animations, both old and new, hand-made and Flash-based. The spacey, jazzy scores sounded great! 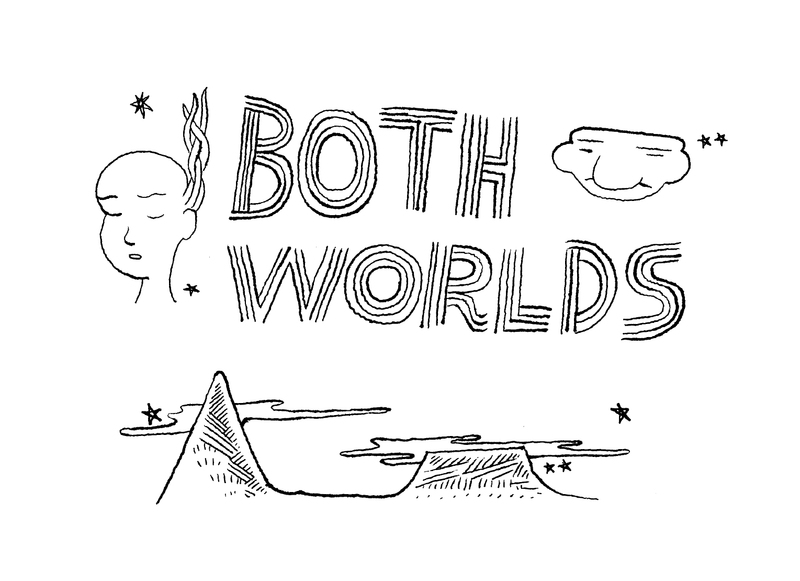 One of Stefan's newest animated shorts is called "Both Worlds" -- it's difficult to describe how neat his live narration was, complete with improv synth back-up from his partner Vida and some rousing audience participation. It was just very nice to hear a roomful of adults un-self-consciously reading out strings of rapidly shifting syllables that made us all sound like we were making weird mooing noises. 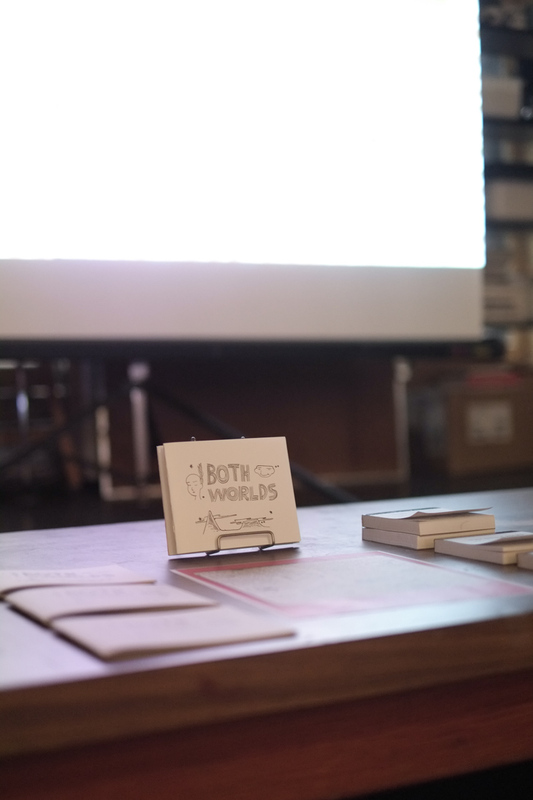 He left us with some super sweet flipbooks that you can come check out at the store if you missed the event. Thanks, Stefan! In this issue of Hobo: interviews with art director Peter Miles, actress Déborah François and artist Rodney Graham; a feature article and interview with Harmony & Rachel Korine (shown on this compelling front cover); and a ton of literary and photographic works, including Hobo's Poetry Vol. 3, and more! 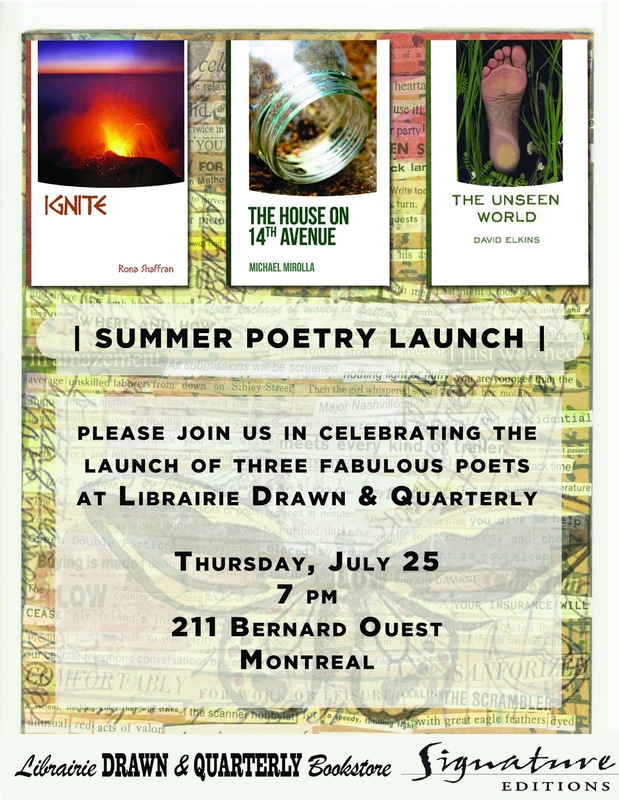 Last Thursday, Librairie Drawn and Quarterly was pleased to host an evening of poetry with Signature Editions authors Rona Shaffran, Michael Mirolla and David Elkins who read from their recent works. The M.C. of the evening was Montreal author Antonio D'Alfonso of Guernica Editions. Following Antonio's introductions, Rona Shaffran took the stage, reading from her book Ignite. Not shying away from the sensuous, Rona's poetry steamed up the already hot summer night! Next up was Michael Mirolla reading from The House on 14th Avenue. 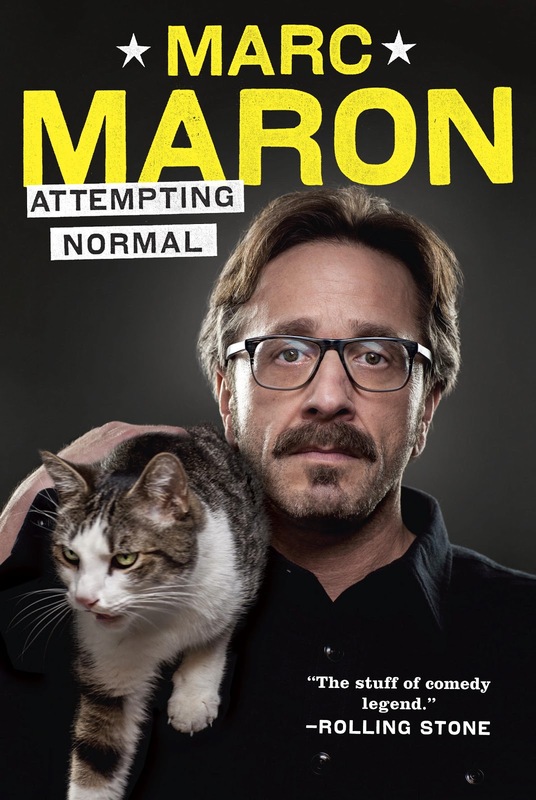 Particularly poignant were his highly personal poems about his "quasi-centenarian" father, which managed to be both amusing and touching simultaneously. Next, David Elkins took the stage. Evidently a man of many talents, he opened with a mean E.E. Cummings impersonation which had the audience in stitches, before launching into his own work from The Unseen World. After a brief intermission, all three authors read for a second time, and then signed copies of their respective books. Refreshments were then enjoyed by all! We just received the new issue of everyone's favourite all-purpose magazine and it's packed with musical prose, including Rookie mag's Tavi Gevinson on Taylor Swift; interviews with Scott Walker, Feist, Ishmael Butler of Shabazz Palaces, and Antony Hegarty; an essay on the Village People; and a Top Ten from Greil Marcus. Also included is a compilation of new music "in the orbit of jazz," featuring Flying Lotus, Colin Stetson, Mary Halvorson, and more. They used to put these on CDs, but of course it's a download code now. Believers, rejoice! It's that time again: Optic Nerve No. 13! I know you've all been jonesing for a new installment of Adrian Tomine's Optic Nerve for two entire years, but don't worry, it's here ahead of schedule, courtesy of D&Q! These two new stories are just as thoughtful and meticulous as any of Tomine's work: with a style that's equally filmic and literary, he's a master of drawing the universal element out of personal devastation. This time around, it's a pair of troubled 12-steppers and a young Japanese mother that feature, all rendered with the same fine touch that's made his reputation as one of the finest comics artists working today. Make sure to get a copy—rumour has it that future Tomine releases will be rolling out from opticnerve.tumblr.com from now on! KIDDING. You don't even have to flip open the cover to see how that idea would go down! And that's what makes Optic Nerve such a delightful gem—perfectly capped off with another round of fan mail at the back. TONIGHT: Comics & Animation by Stefan Gruber! 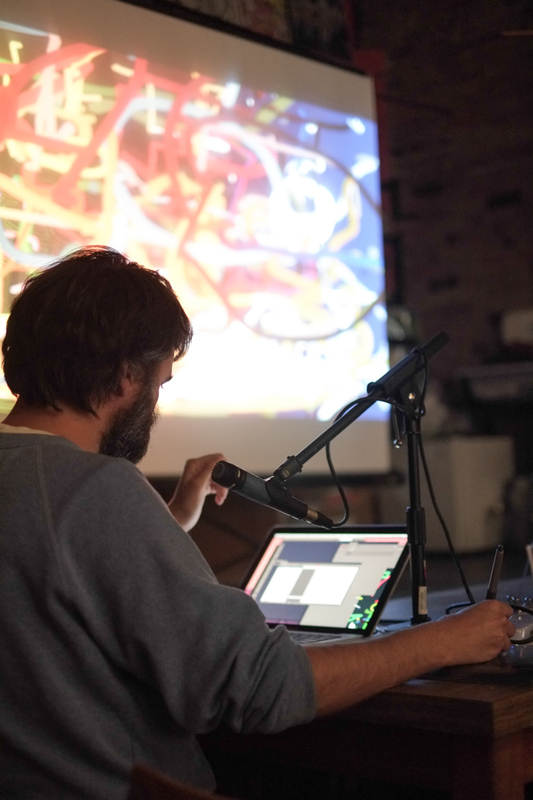 Join us TONIGHT, Wednesday, July 24th at 7 pm for a screening and performance of comics and animation by Stefan Gruber, an experimental animator and performance artist from Seattle. His three-part act includes live animation, a live voice performance, and an entertaining array of audience interaction that is rarely seen elsewhere in the world of animation! Gruber's work has appeared in Kramer's Ergot and the SOS anthologies. His dvd collection, handmade flip books and new comic book Both Worlds will be making their Canadian debut here today. In Gruber's new comic Both Worlds, deities living on the tops of neighboring mountains trade their secrets about how to take care of the flora, fauna, and animals on their mountainsides. Both Worlds exists now as a comic, a film with live elements, and a giant mural in Seattle's Cal Anderson Park. Montreal is the main destination for his 27 city tour this summer! See more of Gruber's animation here. Wednesday, July 24th at 7 pm! 211 Bernard Ouest! Rock Camp for (Riot) Grrrls! This week is an exciting week, not just because the dreadful humidity has abated, but because it's Rock Camp For Girls week in Montreal! Rock Camp For Girls Montreal, one of many similar camps in cities across the land, gives girls aged 10-17 the chance to form a band, learn to play their instruments of choice (including their vocal cords), write a song, and perform at a showcase, all within the space of a week. I've been to some of the shows over the years, and let me tell you, the campers always blow everyone's socks off! 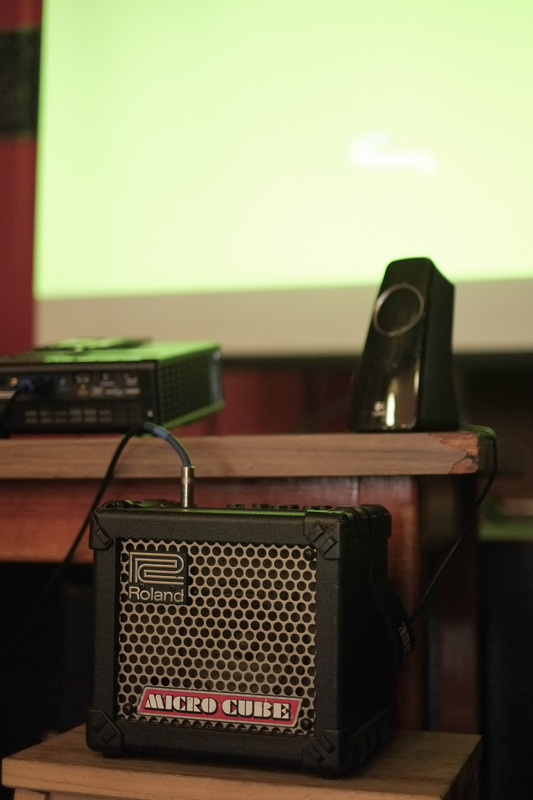 This year's Rock Camp For Girls showcase is this Saturday, July 27, at 5pm, at Sala Rossa. You should definitely go! And be sure to buy your tickets in advance, because it just might sell out! Rock'n'Roll Camp For Girls provides fun and simple instructions for grrrls (of all ages) who want to take rocking out into their own capable hands. Each section is written by a different woman/group of women - and each provides some essential guidance on playing an instrument, starting a band, setting up sound equipment, booking a show, and building solid community around & through music. There's even a forward by Carrie Browstein of the most excellent Sleater-Kinney (fun fact: yours truly is in a Sleater-Kinney cover band that formed for a Rock Camp For Girls fundraiser last year)! The Riot Grrrl Collection offers a history of riot grrrl through a scrapbook-style collection of posters, flyers, and zine excerpts. As Lisa Darms writes in her introduction, the Riot Grrrl movement was complex and contradictory, never "a single thing" or an isolated phenomenon. Like other movements for liberation, it inspired, it fought, and it united people through anger, creativity and resistance. It also made mistakes, and excluded people, and ended up, like many other movements, becoming less culturally and politically relevant through its lack of self-examination. This collection is offered as a history, and as a call for the creation of new groups, projects, and movements that can learn from the breakthroughs and shortcomings of riot grrrls past in order to build new feminist movements for resistance against all forms of power! Attention bike nerds: Boneshaker 12! Have you been reading London's Boneshaker mag? They cover the world of cycling from its oddest angles: less interested in gear and performance than in personalities and adventures. This time around: rickshaws, railbiking, roadway politics, and more. Pedal on over and pick one up! Let's start with the facts: Daniil Kharms was born in 1905 in St. Petersburg. 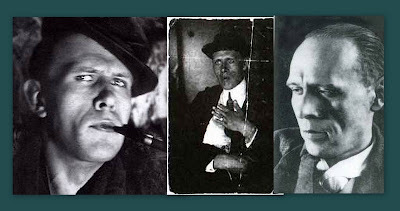 Thirty-eight years later, while the Nazis were beseiging Leningrad, he died of starvation in a psychiatric hospital, where he had been placed by the Stalinist government -- mainly because they considered him simply too weird to be on the loose. During his life, he was known as a writer, though his only publications while he was still alive were children's books. Today, he is mainly called an Absurdist, though he was associated with late wings of Russian Futurism and Constructivism. He was a pioneer of performance art and a co-founder of the Oberiu, or “Association for REAL Art.” He is one of my favourite authors. I first encountered Daniil Kharms' minimalist, black-humourous stories (today, they might be called "microfictions") in a volume called Incidences, translated and edited by Neil Cornwell, and I was totally taken with their extreme brevity (some of his stories are only a few sentences, shorter than any "fiction" writer I know of, save Lydia Davis) and morbid irreverence. Though it's unlikely he knew of them, Kharms' style is very much a part of the same zeitgeist as Kafka's nightmarish fantasy and Dada's attacks on artistic convention and social propriety. As much as I enjoyed Cornwell's collection, however, I always had the impression that the translation was less than ideal. So I was delighted to find out that a newer collection exists, with translations by Matlei Yankovich. We just got it in at the store for the first time! Here are some of our bestsellers of summer so far! Next Thursday: An Evening of Poetry with Signature Editions! Join us on Thursday, July 25th at 7 pm for an evening of readings and insights from Signature Editions' Spring poetry line-up: Rona Shaffran's Ignite, Michael Mirolla's The House on 14th Avenue, and David Elkins' The Unseen World. The evening will be hosted by poet, essayist and novelist Antonio D'Alfonso. 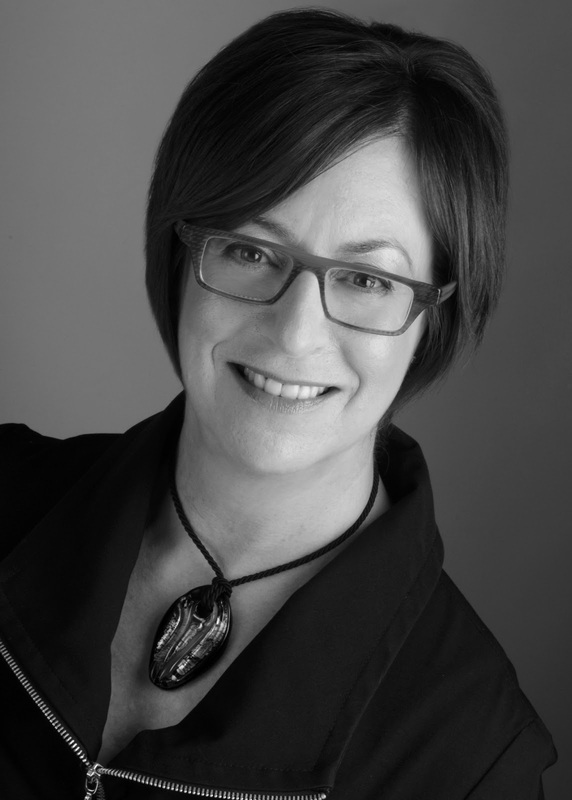 Rona Shaffran recently retired as co-director of the Tree Reading Series, one of Canada’s longest running poetry venues, where she is also a member of the board of directors and organizes master poetry workshops. She is a graduate of the Humber School for Writers and the Banff Centre Writing Studio. She has won honourable mention for the John Newlove Poetry Award. Retired several years ago from federal government work, Rona has chaired the boards and committees of many non-profit organizations. 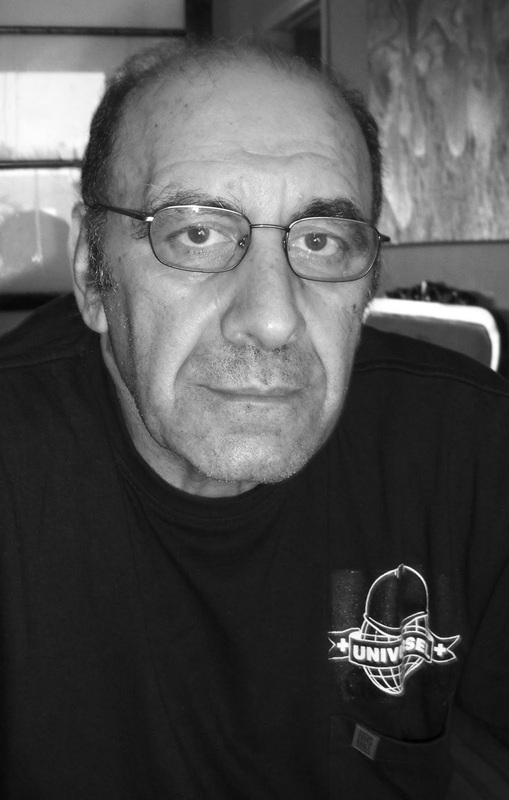 Michael Mirolla is a novelist, short story writer, poet and playwright. His publications include two novels: Berlin (a Bressani Prize winner and finalist for the 2009 Indie Book and National Best Books Awards) and the recently-released The Facility, which features among other things a string of cloned Mussolinis; two short story collections: The Formal Logic of Emotion and Hothouse Loves & Other Tales; and two collections of poetry: the English-Italian bilingual Interstellar Distances/ Distanze Interstellari and Light And Time. 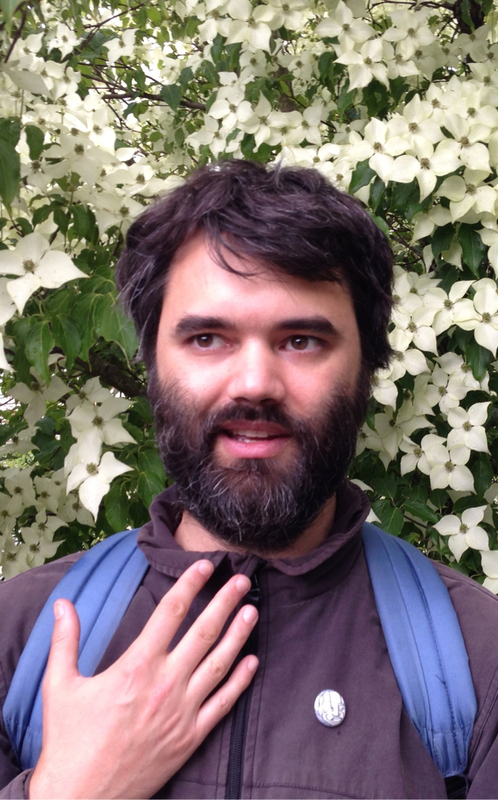 His short story, “A Theory of Discontinuous Existence,” was selected for The Journey Prize Anthology, while another short story, “The Sand Flea,” was nominated for the Pushcart Prize. A poem, “Blind Alley,” was shortlisted for the Winston Collins/Descant Prize for the Best Canadian Poem in 2007. David Elkins is a poet and short story writer. His poems have appeared in Harper’s Magazine, The Page, Panorama, and Now and Our Times. He won the International CKG Award for Poetry in 1992, and his work has twice been selected for Silver Awards. 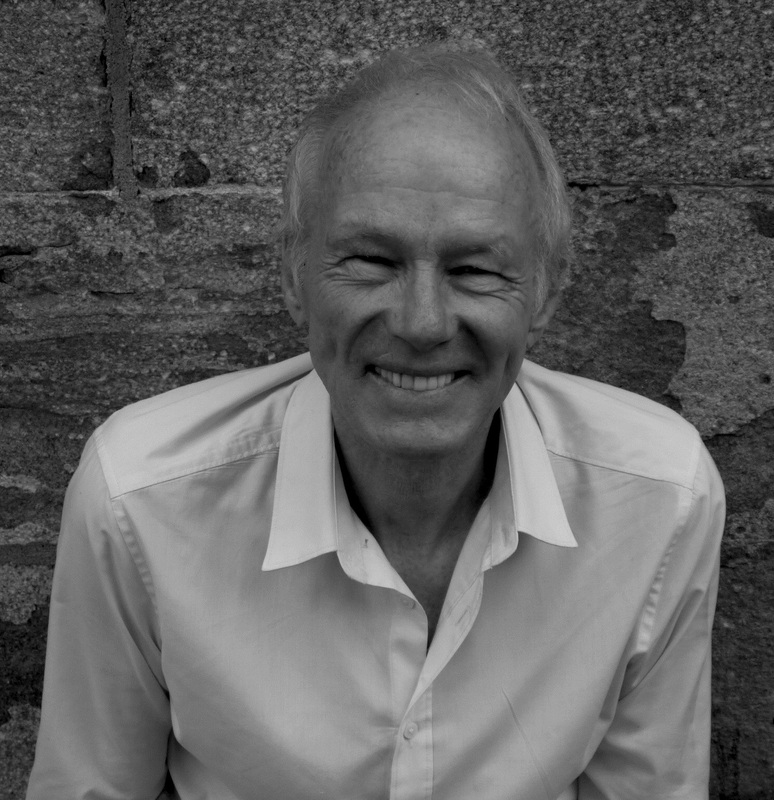 His work includes Relative Exposures: Felling the Family Tree (1998) and A Bulldog’s Guide to Small Engine Repair (2002) which he published under the pseudonym Portlin Cochise. He was a finalist for the A. M. Klein Award and was featured artist at the Ottawa Writer’s Festival in September 2002. Thursday, July 25 at 7! 211 Bernard Ouest! Thoughtful new memoir: Rebecca Solnit's The Faraway Nearby! Solnit's first book since 2010's Infinite City is here! This time, her finely-tuned instruments of observation are turned towards the various ways we become distanced from ourselves: travel (with a characteristically excellent sequence on her voyage to Iceland), illness, and writing itself. Weaving between memoir and personal mythology, and toying constantly with that boundary, The Faraway Nearby is a "finely-wrought, intense and eloquent manifesto for hearing stories – and making them up." New in stock: The Editorial Magazine #8! After a drought of a few months, we've restocked on The Editorial Magazine, a Montreal-based arts and fashion journal. This issue features an interview with infamous net-art bad boy Brad Troemel, illustrations by Jamian Juliano Villani, a fashion spread on Vancouver's Stratchcona Stockings, a music feature on White Poppy, and photography from Mark Peckmezian, Brad McMurray, Madeline Glowicki, Monika Mogi, and more! 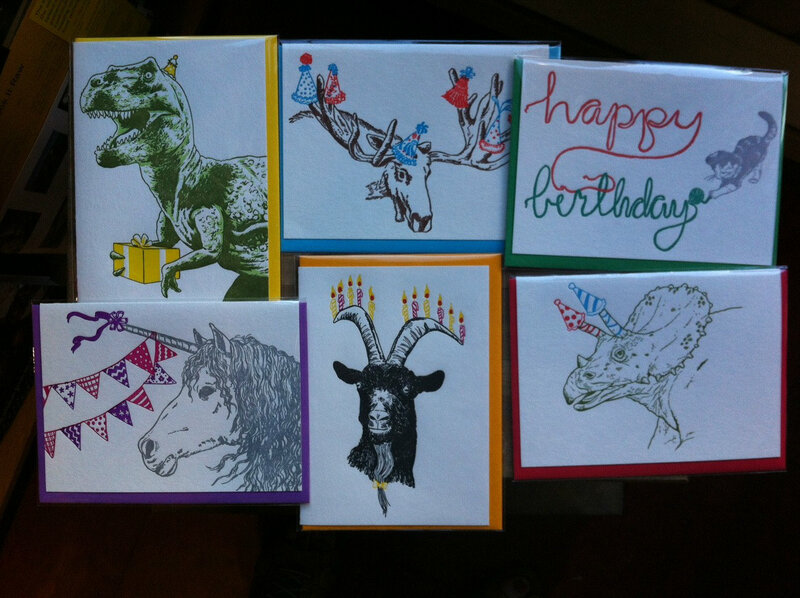 Awesome new illustrated cards from Papillon Press! Literally hot off the press - we are happy to now be carrying greeting cards from Papillon Press, a proudly independent, DIY Canadian letterpress specializing in stationary. The craftsmanship of these cards is fantastic, as they are all hand-printed on a 60-year old letter press, and the illustrations are from handmade, original ink drawings. Old school charm! They're also printed on eco-friendly bamboo paper, and come with vibrant matching envelopes. 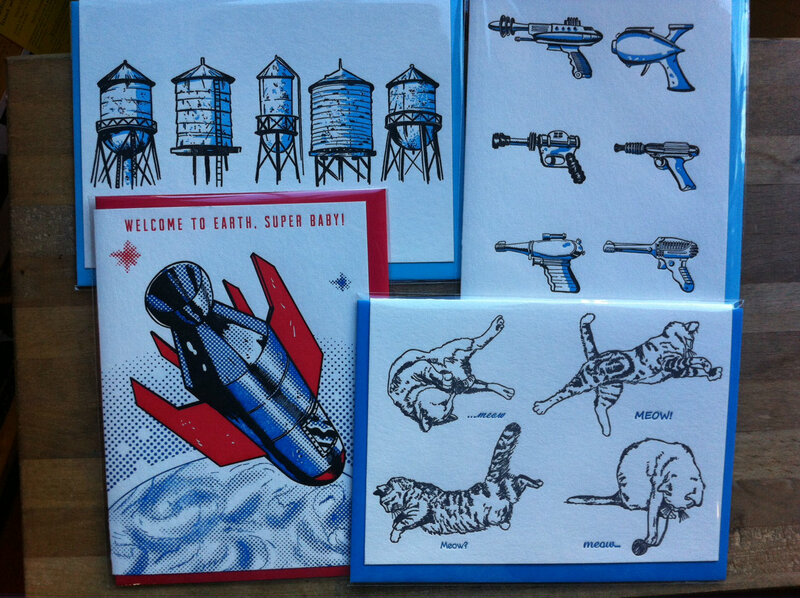 Also quite wonderful are these vintage sci-fi inspired cards with ray-guns and spaceships - plus some cats and water towers thrown in for good measure! Who wouldn't be happy to receive such a card on their special day? Come down to the store see how nice these are for yourself. We'll be getting more new cards in all summer, so check back for updates. New Dash Shaw: New School! Dash Shaw delivers on the hum of anticipation for his first non-serialized release since 2008’s Bottomless Belly Button. New School, like previous work, is drenched in pseudo-Biblical mischief and malaise. It's a simple story: estranged brothers, the older one far away from home. Their parents send the younger one to fetch his brother. This is Dash Shaw, however, and there are more than a few gratifying head-scratchers to be found: characters from the nineties speaking like bygone rakish aristocrats, colours that barely acknowledge lineart or panel borders. As with Shaw's other work, you'll just have to dive in and let his warped logic wash over you. Original and immersive.